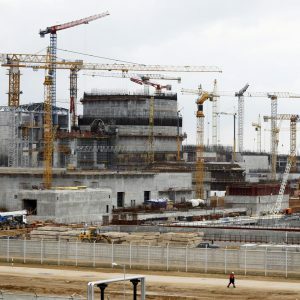 BelarusDigest > All > Astraviec Nuclear Plant: a Poison for Belarus-Lithuania Relations? After the 2015 October presidential elections Belarus gears up for a parliamentary one on September 11 with little expectations of democratic improvement. Albeit authoritarian, Belarus is both a functional state and society. The EU is learning to live with this reality due to tensions in its Eastern neighbourhood, the fact that it has no reliable political allies within Belarus, and Minsk’s effort to reduce those geopolitical tensions and holding a more responsive dialogue with the West. Belarus is the only remaining country of the Eastern Partnership with territorial integrity. Given the political turbulence in Ukraine and Moldova, Belarus may also now be the only EaP country without political prisoners. The Ukrainian crisis and a resurgent Russia put Belarus’ capable, albeit repressive, state under new light. The notion of local stability may prove wishful thinking if geopolitics continues to heat up. Without a finessed approach in the West, Lukashenka, always a deft maneuverer, might not be able to continue to resist falling under the spell of Russia’s influence. The EU’s policy should not sacrifice democracy for the sake of security, but rather the former should be viewed as an endgame instead of an ultimatum defining the relationship. Lukashenka’s political longevity has stemmed from two sources: institutional stability and an a la carte friendship with Russia. Brussels has learned to despise and appreciate both. Lukashenka lived up to his 1994 electoral pledge to reinstall a centralised system that in some policies, procedures and symbols resembles the former Soviet Union. The liaison between Soviet-era bureaucrats and power-hungry new supporters of Lukashenka led to power consolidation and a mix of centralised public institutions. They have run the country in a stable manner with a viable social contract, relatively successfully as it relates to governance and the economy. Fortified by Lukashenka’s personal skill in making Russia pay for Belarus’ posturing as its only “genuine” ally, the seemingly impenetrable country frustrated the EU’s end-of-history-style one-size-fits-all democratization effort. However, the infamous “power vertical” might now be causing Russia more annoyance than the West. This should not lull the EU into complacency. Belarus is a country where Russia`s soft power functions in most effective manner. Belarus shares with Russia common media and cultural sphere, Russian language and Orthodox church predominance and a significant presence of Russian banks. Deep connections link secret services, law enforcement, and the military of both countries. In addition, almost total energy dependency, and open borders are not new factors for Minsk to encounter. Moscow`s feeling of existential threat, its military confidence stemming from Ukraine and Syria, its effective media, and the “Russian world” promotion do represent new risk variables for Belarus. Speculation that Russia might be losing patience can hardly be dismissed. Previously more concerned about Russia, the Baltic countries have started to worry about Belarus. Lithuania’s latest threat assessment, for example, repeatedly mentions Belarus, whereas in the 2014 edition, it was barely mentioned at all. None of Russia’s three recently announced deployments are to be placed close to the Baltic borders. One of the divisions, however, is to be deployed at the border with Belarus. With regard to joint defence needs, including particularly air defence, Belarus has routinely requested “contributions” to its defence forces. The Russian contributions of military equipment are, however, either regularly delayed, or arrive in the form of outdated models. The much heralded Russian military air base in Belarus was quietly fended off. Meanwhile, Belarus has launched attempts at establishing “strategic” military cooperation with China – and allegedly with Ukraine – produced its own advanced surface-to-air missile system Polonaise. In February 2016, the government updated its military doctrine dating back to 2001. Its main target is not conventional war but a hybrid one comprising terrorist and (political) extremist activities. Minsk is aware that the West no longer prefers revolutions in the neighbourhood. Yet, it cannot afford a political shift away from Russia. The Belarusian economy has been struggling for years, with inflation rising and real incomes plummeting. New taxes are constantly being approved, the form of which have reached absurd heights: one example being a tax on “social parasitism/unemployment”. These policies fail at generating necessary revenues, ignore the elephant (state owned enterprises) in the room, and antagonize the population. Yet, the country`s beleaguered political opposition, with only four months remaining until the parliamentary elections, has managed to produce only several badly coordinated lists of candidates. A more potent challenge to introduce reforms is posed internally by the old government guards and the “siloviki” – the security services and law enforcement. The economic re-shuffle prepared by a handful of reformers aims to move the country from a planned economy to a regulated one. Even such gradual changes would deprive them of the veto power and target arbitrary state management, a change impossible to accept for many in Belarus` neo-Soviet power hierarchy. A murky episode involving the recent arrest of businessman Yury Chyzh underlines the potential of internal struggle. This arrest, and the KGB involvement in it, indicates that the power mechanisms in the country might be less centrally controlled than commonly thought. Additional speculation posits that Chyzh bankrupted a company of which Lukashenka`s family were informal shareholders, highlighting the gradual transition between (state) power and wealth in Belarus. Regardless of the true explanation, the opaque, informal and arbitrary rules underscore the fact that reforms are not in the interest of the West but of Belarus. As there are no major carrots from the West and – following Crimea annexation – Russia carries the big stick – the EU is largely doomed to dialogue. After 20 years of opposing Belarus, the West should most of all build trust based on common interests in order to reduce resistance to reforms. As much as the idea of a permanent NATO base might be attractive to the Baltic countries, it would likely push Russia to exert greater pressure on Belarus to accept a Russian military base on its territory. This outcome would not help to achieve deterrence but rather would increase the risk of conflict and subdue Belarus to an overpowering Russia. Relations with Belarus, particularly for Poland and Lithuania, should be a higher foreign policy priority. In this regard, the trip of Polish Foreign Minister Waszczykowskyi in March 2016 is a step in the right direction. Integration is not supported by either side (the EU or Minsk) and the majority of the Belarusian population further show no desire to be integrated into the EU. Nevertheless, Belarus has been slowly turning towards the West: the technology trigger for supporting necessary economic modernization is there. The EU’s policy towards Belarus already includes increased engagement with the government. 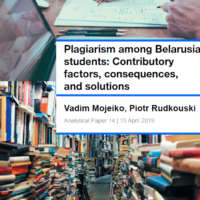 Exercised with caution, this policy has the long-term potential to help make Belarus` notorious informal decision-making process more transparent. The EU is already strengthening its focus on education. It should also emphasise the careful promotion of structural reforms, taking into consideration the principles of its social economy and the general aim to modernize local industries. While such dialogue may ensure a relationship built on common interests, concern for democratic elections should not be neglected. The Spanish transition model might come useful here: democracy can be the end result, even if not necessarily the beginning of a successful transition process. Russia’s perception of encroachment from the West could spiral out of control, particularly in the presence of any dramatic events, as it did with the case of Ukraine. Given the geopolitical sensitivity of Moscow towards Belarus as its last ally and a territory linking it to Kaliningrad, such an event may not need to be as significant as the Maidan was in Ukraine. 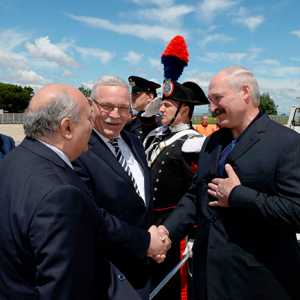 Lukashenka will play his part in keeping both sides mildly satisfied. Yet even his manoeuvring power is limited, given domestic economic challenges, resistance toward reforms, and Russia`s dominance. It is now up to the EU to demonstrate normative finesse in developing its relations with the country, both for the sake of local democracy and regional stability. Balázs Jarábik is a visiting scholar at the Carnegie Endowment. Alena Kudzko is a research fellow at the Globsec Policy Institute. A longer version of this article is available at cepolicy.org.